A candidate isolated massive dark galaxy VirgoHI21, was detected by Davies et al (2004) during the HI Jodrell All-Sky Survey (HIJASS) and corroborated by Arecibo and WSRT observations (Minchin et al 2007 ). VirgoHI21 lies some 100 kpc north of NGC 4254, M99, one of the brightest spiral galaxies in the Virgo Cluster. Well-known for its prominent optical lopsidedness and strong m=1 spiral mode, NGC 4254 is about 3 degrees, or 1 Mpc at the Virgo distance, from M87 and appears to be moving at very high speed relative to the cluster. Previous observations have suggested that the galaxy is falling into the cluster for the first time. It is, however, not HI deficient. As illustrated in the Figure to the right, the more sensitive ALFALFA observations of the entire field show clearly the existence of a huge HI stream emanating from NGC 4254; VirgoHI21 is only one condensation (see below) in this stream. The amount of HI detected in the tail by ALFALFA is only about 10% of the total HI gas associated with NGC 4254. See Haynes, Giovanelli & Kent (2007) for further details. 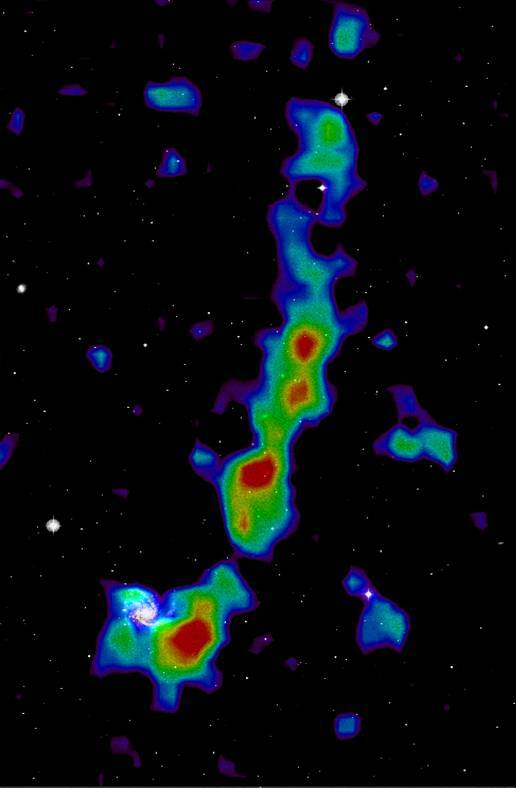 The figure to the right shows contours of HI column density obtained from the ALFALFA observations of the field around VirgoHI21 and NGC 4254 superposed on an optical image. The HI tail extends from NGC 4254 (visible in the lower left) more than 250 kpc to the north (assuming it lies at the Virgo distance of 16.7 Mpc). The figure below illustrates the relationship of the feature identified as VirgoHI21. From left to right, the figure shows the much poorer sensitivity of the map made by Minchin and collaborators with the Westerbork Synthesis Radio Telescope (WSRT), a blow-up of their map in the region of VirgoHI21, and its position within the much wider area and more sensitive ALFALFA map made at Arecibo (shown in color in the figure above). The rightmost panel traces the velocity of the peak of the HI emission and its velocity spread along the HI stream as detected in a set of follow-up observations made at Arecibo with the single-pixel L-band wide receiver. It is clear that the WSRT map detected the peaks of the HI but it did not have adequate sensitivity to be able to trace the entire structure. Hence, Minchin et al did not detect much of the gas in between the condensation they identify as VirgoHI21 and NGC 4254, nor could they trace its continuation towards the north, clearly evident in the Arecibo observations. The more sensitive Arecibo map also reveals that the velocity gradient seen in the vicinity of VirgoHI21, which Minchin and collaborators interpreted as evidence of rotation, is part of a much large scale velocity field. Note that the ALFALFA map shown here does not cover the velocity range which detects the redshifted HI from NGC 4262 or the object labeled "C" in the middle panel. In a recent paper, Duc & Bournaud (2007) have modeled the formation of a tidal tail closely resembling that seen in the figures above by a very high speed encounter of NGC 4254 with another cluster member now located several degrees away. The wide areal coverage and superior sensitivity of the Arecibo telescope and the high data quality achieved by its "minimum intrusion" observing strategy make ALFALFA ideal for detecting extended features at the Virgo distance. Indeed, ALFALFA has discovered a number of other optically-dark HI clouds in the periphery of Virgo which may be of similar origin. That effort is led by Cornell graduate student Brian Kent. Perhaps a better example of a "dark" galaxy is the southwest component of HI1225+01 discovered serendipitously at Arecibo by Riccardo Giovanelli and Martha Haynes in 1989.